Salmon farming is the fastest growing food production system in the world—accounting for 70 percent (2.4 million metric tons) of the market. Increasing demand is leading to the gradual development of responsible practices to minimize its negative impacts on the environment. 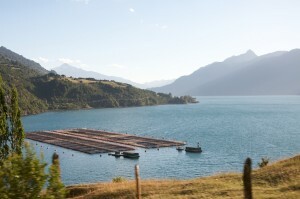 Indeed, salmon farming is known to pollute the oceans, use toxic pesticides to control the spread of sea lice, foster diseases caused by viruses and bacteria, allow escapees, and deplete the stocks of forage fish—depending on the production region, 1.5 – 8 kilograms of wild fish are needed to produce one kilogram of farmed salmon. However, despite the development of the open and transparent production practices encouraged by the WWF in 2004, and currently managed by the Aquaculture Stewardship Council (ASC), salmon farming is plagued by numerous problems. A deadly algal bloom is killing millions of farmed fish salmon in Chile, causing a drop of 35% to 45% in exports this year. In addition, the recent research finding that farmed Atlantic salmon from Norway, Australia, Scotland, Canada and Chile are going deaf is both surprising and alarming, raising questions about animal welfare and conservation efforts. Farmed salmon have deformed otoliths (or fish earbones) and, as a result, poorer hearing. Otoliths are located behind a fish’s brain and are essential for hearing and balance, much like the inner ears of humans and other mammals. The typical structure of healthy otoliths is made up of calcium carbonate. However, in most farmed Atlantic salmon, the calcium carbonate is present in the otoliths in a different crystal form, leading to larger, lighter and more brittle structures. This deformity is very uncommon in wild fish. The researchers point out that the deformed earbones could be responsible for the low efficiency of conservation programs, thus explaining the origins of what, in the field, is considered a long-standing mystery. Every year, billions of captive-bred juvenile salmon are released into rivers worldwide to boost wild populations, but their survival is 10-20 times lower than that of wild salmon. The new finding may help explain this low survival rate. Hearing loss could prevent fish from detecting predators, and restrict their ability to navigate back to their home stream to breed. Researchers do not know what the triggering factor for earbone deformity is—they speculate it could be something in the fish’s diet, or a genetic component unique to the salmon selected to be farmed, or it could be related to their abnormally rapid growth rate. Salmon farming is a work in progress. Knowledge and experience, along with commitment to sustainable practices, are necessary for successful production. The unexpected finding of hearing loss in farmed salmon all around the world shows that scientific research is a needed component of adequate farm management and further development of sustainable practices. Interesting problem. I wonder if researchers have looked at the possibility of calmodulin being affected by lead contamination (in food or water in the hatcheries and holding/rearing areas)? Calmodulin has many regulatory effects on how calcium can be found in tissues and especially in hard parts such as bone. Otoliths would likely record Ca/Pb / Barium ratios sclerochronologically over the growth history of the otolith. I’ve seen papers on the Pb causing calcium crystallization changes. Google: Petri Ursula, calmodulin, lead, Pb, 2007. This search can start a glance into a possible line of questioning about deformed otolith causations.